Richard has spent his entire week of annual leave lovingly building a greenhouse. Made almost entirely for free – the framework came from a friends small shadehouse which Richard extended with metal framework from my parents dismantled bird aviaries. The pieces magically slotted together to form this beautiful mega-framework. 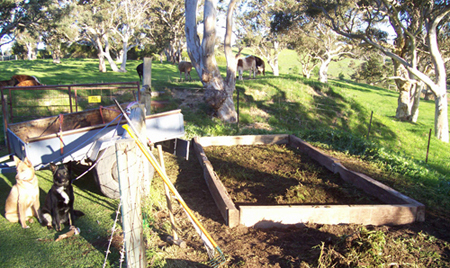 We had to spend a small amount on a piece of wood, some fixings, compost, gravel and plastic – but all up I think it was less than $100. Pretty impressive. It even has a tap within and a raised bed and will have benches/tables for potting! 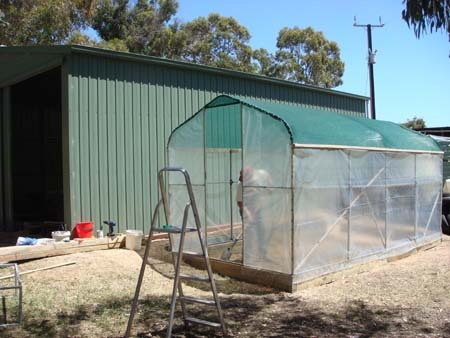 The result – an impressively sized greenhouse ready to hopefully supply us with greens over winter and a head start on tomatoes in the spring. A friend of ours helped Richard dig the flat foundation last weekend (a hell job with pick axe into what is basically rock) and this jump-started the week long project to the point where Richard almost finished completely. Richard didn’t get much rest during this holiday. As you can see from the photograph, Gandalf was the ever helpful cat. Richard only has a few small bits left to finish, so I’ll add some final images once it is finished, but for us this is a very exciting addition to our small dreams of becoming more and more self sufficient. Over the weekend we added a quince tree to the orchard that Richard picked up for a bargain at the local charity auction. I must admit to not knowing too much about the humble ancient quince, but after doing a bit of research I’m quite excited about it’s future fruiting and potential jars of home grown marmalade and other quincey things. I also received some free melon seeds from Diggers late last week. The thought of the water it might take to grow large melons had meant I’d never really considered them for our place as we have to be a little careful being just on rainwater. However I was excited to find out that these are small heirloom melons called Hao-gen, originating from Hungary. They are sometimes called Israeli melons because of the popularity of them there. Sometimes the chance to grow something new just comes from the opportunity of pure availability like this – so I’m looking forward to seeing what happens. 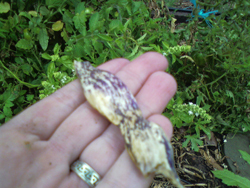 We just harvested our first few delicious snow peas today too —mmmmmm. This week I will be trying to get a few trays of seeds started for spring; lettuces, heirloom capsicum, coriander, dragon tongue beans, rainbow silverbeet and I’ll give okra another go this year. I’d really like it grow as it seems impossible to buy it anywhere. 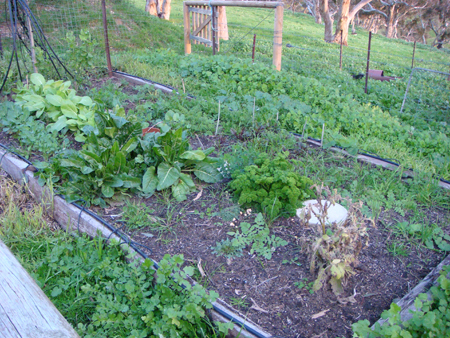 Hmmm…well the vegie patch is looking a little bit wild and untamed … it’s sort of a wilderness of edibles amongst a forest of weeds. 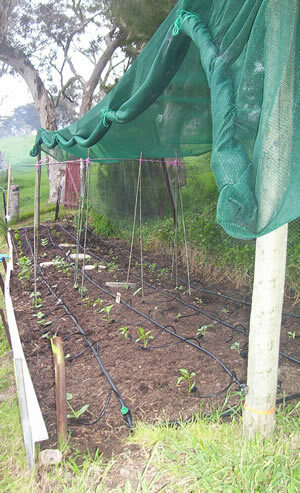 Heirloom potato seeds will be arriving soon so work will be done soon and the patch will be rescued. I can’t believe that I haven’t written since Christmas. Although things have moved on around the farm a little, the harsh, dry summer nearly sapped all my enthusiasm. The cost of feeding our cows over the summer stung our average finances and you really start to wonder what it’s all about. I’ve also not been myself at all because for the last three months I’ve been preoccupied with the scary wait of getting through the early stages of my first pregnancy. Having passed that milestone safely, with lots of sleeping and eating I can finally feel my passion, enthusiasm and imagination for the property coming back with the rains and green grass. I’m not sure where I’ve been, but I’m glad to be back. One important job over the forthcoming weeks are to revamp the vegetable patch for winter. I really haven’t been near it for a few weeks except to pick a few pumpkins and I’m a little scared of the neglect. I have been just too tired to nurture anything else but myself these last few months. I wake up, go to work, come home from work, eat and sleep and repeat the process. On weekends I just eat and sleep. 🙂 I think I’m getting to the better part now although my body is still finding ways to stop me from manual labour. I’ll fight it though – I want big cauliflowers and cabbages on my plate from the garden. 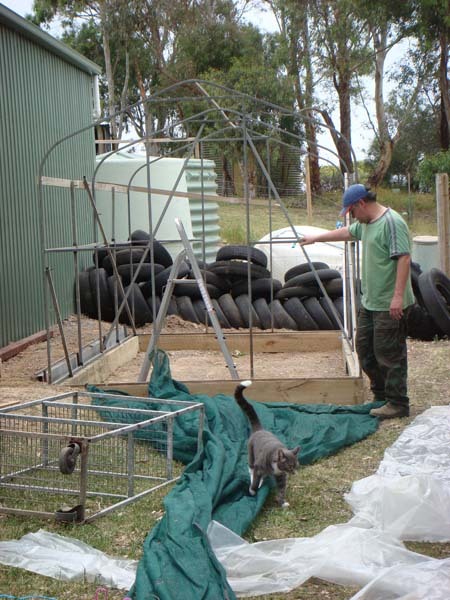 Richard helped a friend dismantle a tiny metal framed shadehouse in his backgarden, and had the excellent vision of extending the frame with some metal from some aviaries dismantled at my parents place. The pieces slot together like a jigsaw puzzle destined to be built. We now have the framework of roughly a six metre by two and half metre greenhouse in our barn, waiting to be fixed and then moved into place. All we need to do is find a suitable fabric to cover it and then we are another step closer to self-sufficiency for vegetables out of season. With a baby on the way the ability to support yourself with home grown organic vegetables becomes even more attractive, there is an increased motivation. Yesterday, we bought and planted Kalamata olive tree for the orchard, and plan to establish the orchard over the next few months. I’m quite interested in using heirloom varieties from Diggers, but we’ll see how we go. We also have a new Sussex hen called Rose and a guest chicken called Bess who is having a return stay at the chicken b & b. Bess is an Isa Brown like our others. We also have five baby chicks, all extremely cute. I missed out on their growing up this time as while I crashed and burned and Richard took on the role of chicken Grandpa. This property is a two person job *at least* so I need to get with it again. We sold our last four Hereford cows a few weeks ago. The cost of feeding them was so difficult over the summer and we’ve now had to sell them just to give the land a chance to rest. We are thinking that our next season may be the opportunity to try a small breed, like Dexters, but this time with the intention of growing our our meat. It is the only way to not lose bags and bags and bags of money – something we can no longer do with a extra mouth to feed. I think it’s finally time to grow up and face the truth about rearing our own meat. If we can’t handle it, we don’t deserve to be meat eaters. Anyway, enough dark tales, now the Autumn is here I can literally feel the life flooding back into me. It’s so strange as my time in the Northern hemisphere taught me to feel autumn as the start of the end, the step towards dormancy, but here in the South, autumn and the promise of winter feels alive. The new location seems to be working. 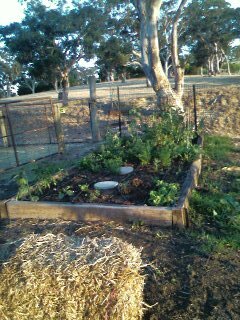 We have our first yield of young lettuces, there’s a chocolate capsicum on its way, some budding tomatoes, silverbeet, the climbing peas and bush pumpkins are chasing the sun up their trellises. The okra is … where is the okra? I’ve misplaced it. I need to find my original patch plan. The vegetable patch is alive with the promise of a beautiful summer bounty …(excuse the dead lawn in the photos before but we can’t justify watering it when we rely on rainwater for all our water). Having hired a rotary hoe last spring and removing all of the sheaok roots strangling our inherited vegetable patch, we thought that we had cracked the dry soil issue. At the end of the summer though we found the trusty sheoaks and their spaghetti roots had returned to the vegetable patch and we were back where we had begun. Also that fact that at times we had to irrigate with saline bore water down there pointed a big finger to the fact that it just wasn’t the right spot. We gave it a go though. So, this spring we decided to abandon that vegetable patch and make it a general orchard area instead, which is currently a work in progress. 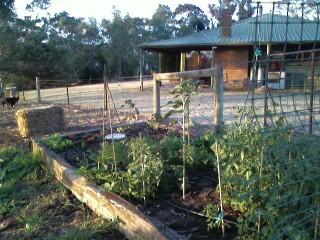 In the meantime, we spent a Sunday siting and building our new vegetable bed which can be seen below. In a few weeks time we have a week off work which will see the planting of the new patch taking place. Being quite near gum trees we might have to compete with a few intrusive roots in future, but it will be nothing compared to the sheoak situation. I also had today off work this week which I spent planting seeds for the site. 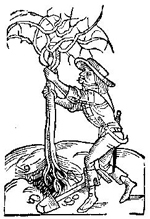 to be sown direct …. Can it have been so long since I last recorded some thoughts about the animals? I have been a little preoccupied with studying which is now all over. After last years disaster veggie patch caused by trying to rush it in a day just after moving in (and therefore having poor soil) it’s that time of year again. 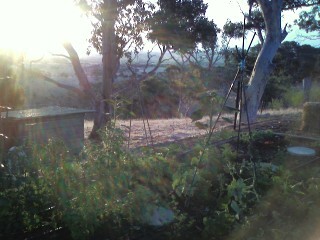 We’ve been here nearly a year and the vegetable patch project has finally made it to the top of the list. We have spent the last three weekends digging the patch, rotary hoeing, shovelling compost and installing a drip irrigation system and moving grapes vines into the area as the whole fenced off section is our orchard/veggie plot. Over 70 plants have now gone in and now with water, time and sunshine we’re hoping this year will bring more success. ..and probably a few I’ve forgotten.